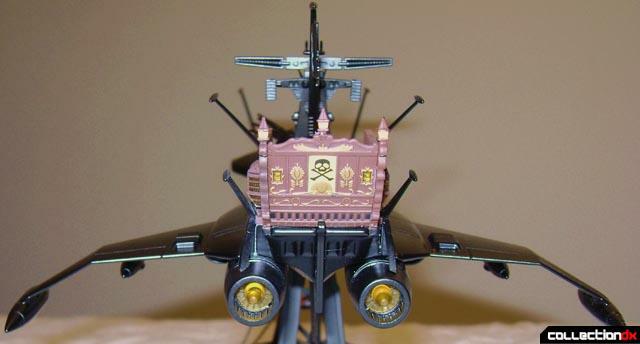 The Battleship Arcadia was a popular cartoon series, captained by the Space Pirate Captain Harlock and ingrained in all our hearts. I started watching this series because at first Captain Harlock was supposed to be Kodai Susumu older brother lost in battle before the Yamato was reforged... to us USA people Derek Wildstar's older brother. 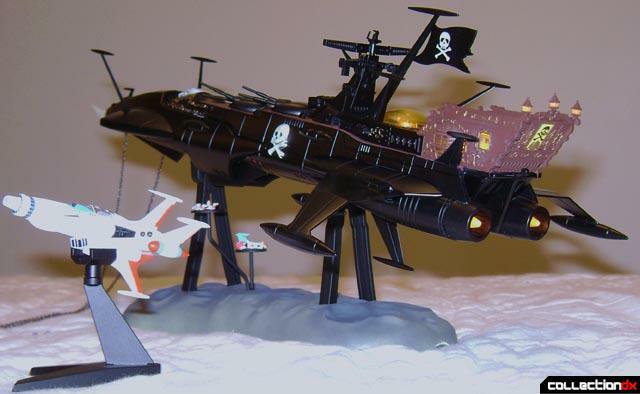 That idea never was made cannon... just like a million origins for Wolverine & Sabertooth... but the cartoon does have that Starblazers feel I love and hence the reason I wanted this piece. A review for the Arcadia TV Anime Version is already on here so I will just generally cover the chogokin and try to sell the Black version. Aoshima is a company that I enjoy buying from. 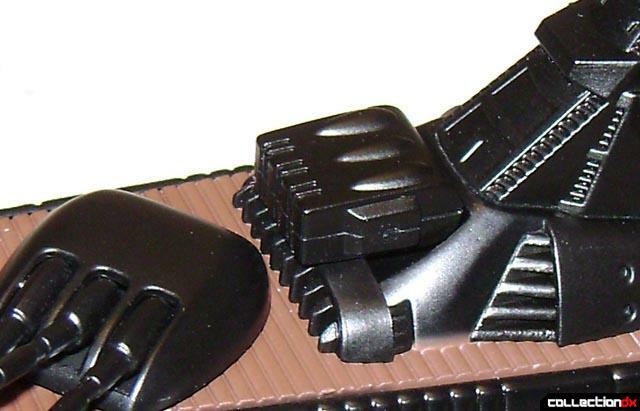 You get a lot of diecast and they generally do not cost as much as other companies. The "yin" to that "yang" are often a couple of imperfections in figure or flaws in painting, but hey for around 100 USD instead of around 200+USD I can accept that. 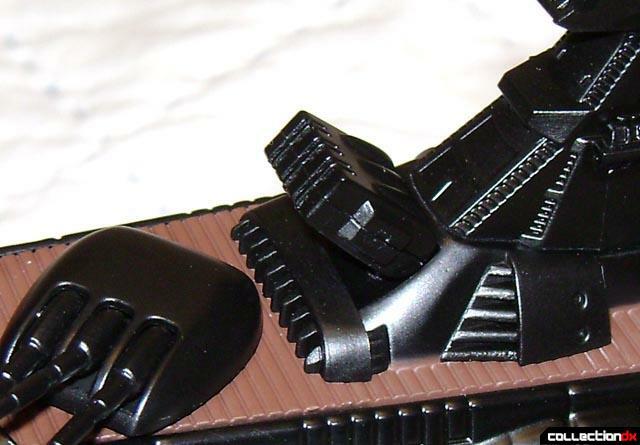 Mine had imperfect white marks on two areas near turrets (easy fix with touch up paint). 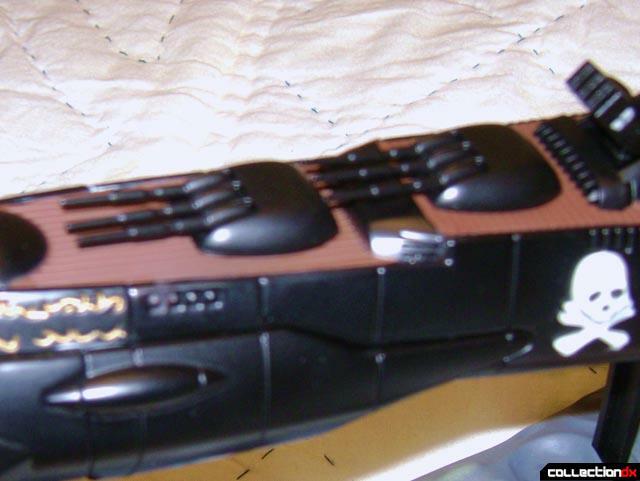 The Ship has a nice heft to it and the main fuselage is nearly all metal. 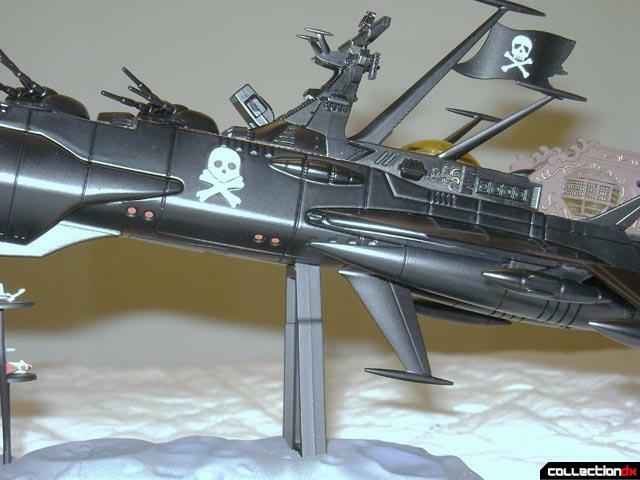 Unlike other Aoshima Arcadia ships (the Blunt nose version?) 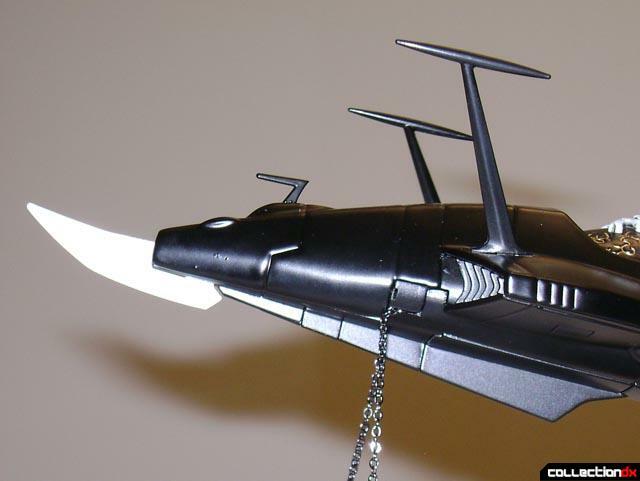 that require flags and bottom fin being put on, this chogokin comes basically fully assembled out of box (I still have shell shock flashbacks to the insane Bandai Yamato assembly). The only thing you need to do is insert a dome (one solid or one clear yellow) and anchors. 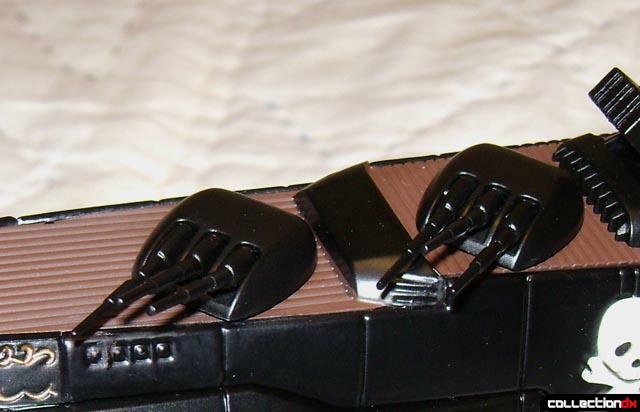 A nice design not mentioned before is the turrets turn in unison and the barrels move in certain sequences depending on position. 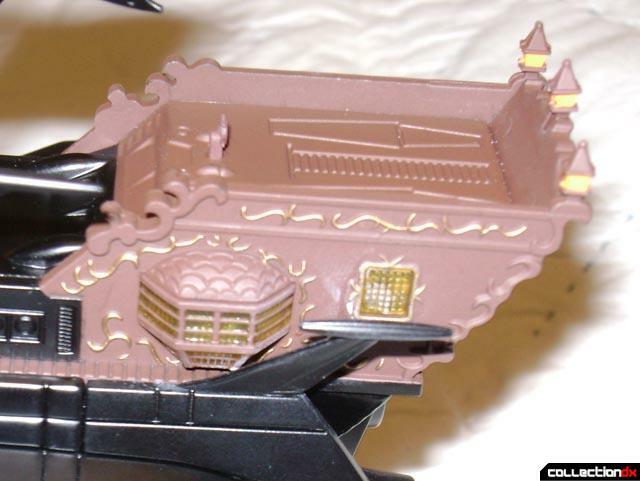 Also a missile turret and bottom fighter flap opens, the "hanger bay door" is pretty small and useless but no big flaw to me. 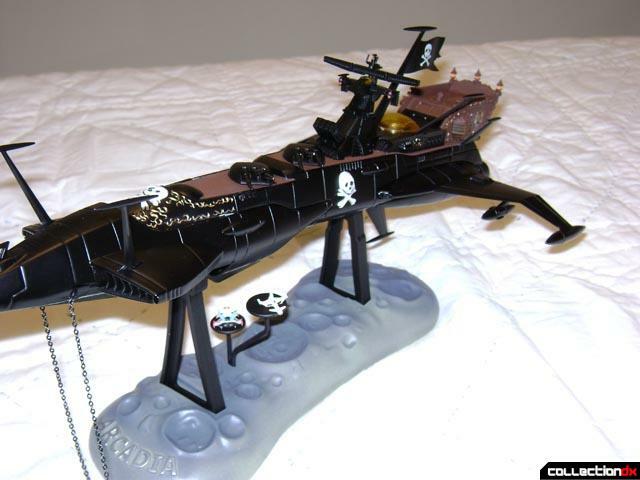 The black version comes with glow-in-the-dark paint on the skulls and the front ship dagger is that cool white "glow" plastic. Charge it up, turn the room to pitch black and enjoy next to your black neo-getter, shin getter, and new getter. 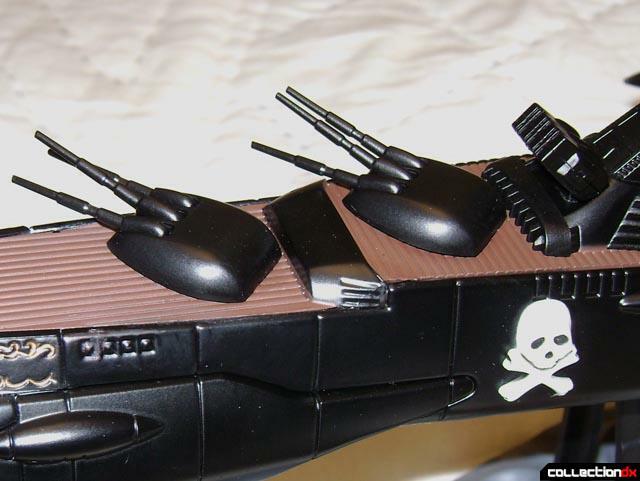 The ship lights up like all the other versions (to my knowledge there are blk. ver, weathering ver., anime color ver., normal ver....are there more??). 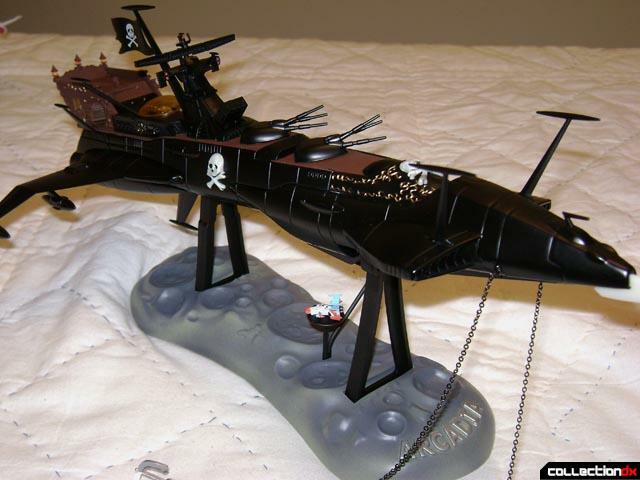 It also comes with a stand and this one has the front of the ship turn up at a more extreme angle than the others. 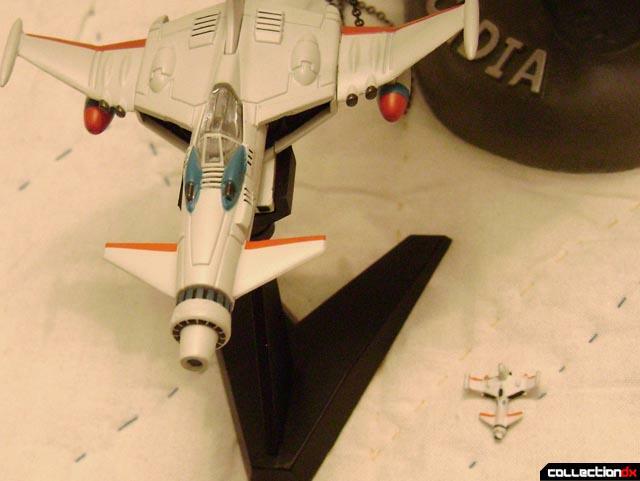 A very nice addition to the Black version that I believe does not come with the others is a larger version of the small fighter (not the bomber) that comes with all versions, of course it has the stand in the pictures, the fighter is all plastic but nice details...and lets not get greedy. 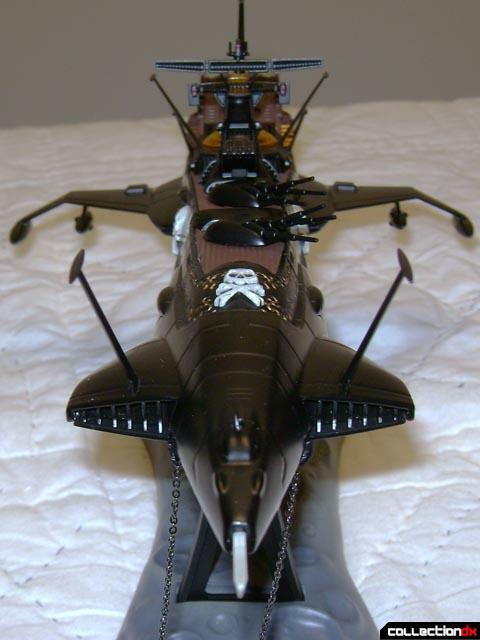 A nice heavy Chogokin, looks nice, and the versions I choose to have...yes, it is my favorite...and yes I loved the large fighter. 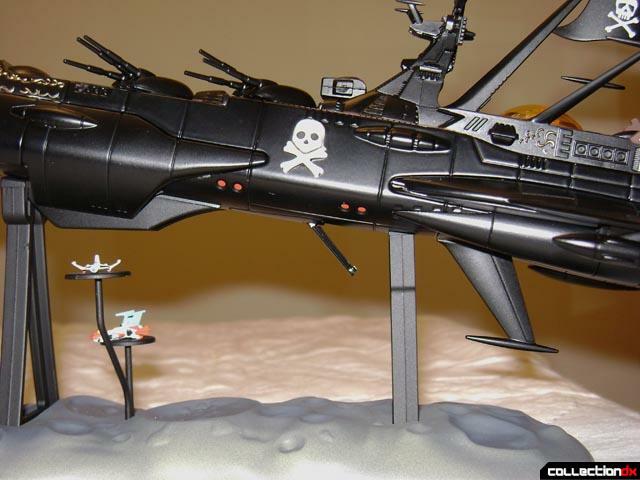 It is displayed next to my Bandai SOP Yamato and eventually my insanely pricey Marmit Andromeda. Once again please read the other Acadia review for more descriptive phrases - I tried not to be redundant. That's a great looking Arcadia. 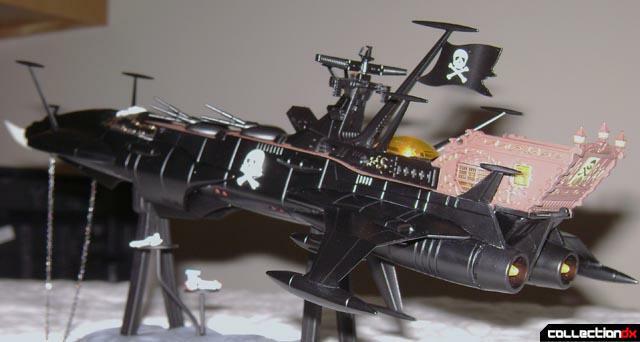 I always liked the ship, this really does it justice. 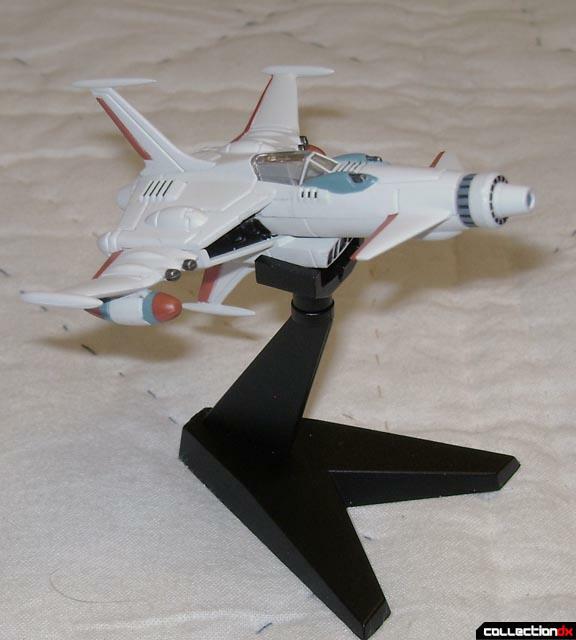 And the cool fighter to boot..
firework sales has it on discount 7400 yen! The Arcadia black version is really awesome! 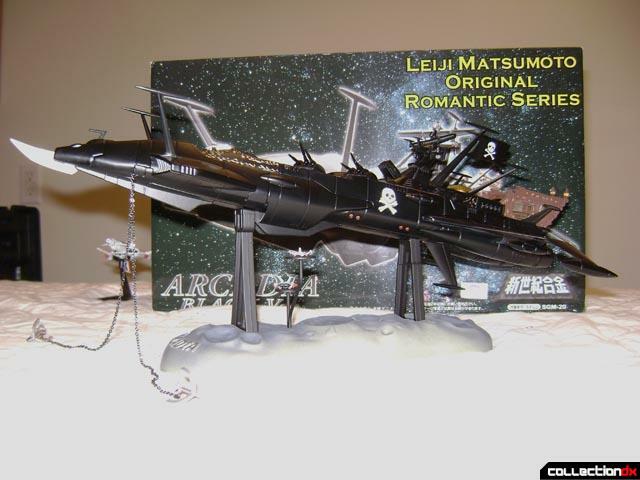 The glow-in-the-dark effects make it more desirable and the Space Wolf bonus makes it a must-have for every Captain Herlock or Leiji Matsumoto-sensei fan. Pity the Space Wolf is not included with the anime version (blue) or at least sold separately.